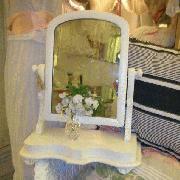 Edwardian Swing Mirror. Shabby chic painted white years ago. Very pretty and will make a chest of drawers into a dressing table.